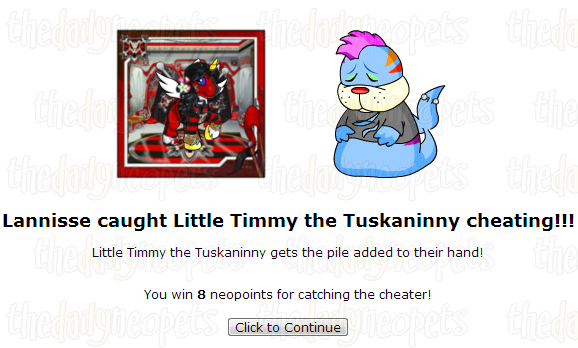 The Daily Neopets → Neopets Game Guides → Cheat! Cheat! is a simple game and it's one of the easiest to earn a trophy. You play against three characters in a total of seven rounds, with the weakest opponent leaving and a stronger one coming in each time you win a round. You have to pay 50 NP to start a round. The object of each round of Cheat! is to get rid of all of the cards in your hand. You get rid of cards by putting them into The Pile on your turn and indicating what the value of the cards are, that is, the number on the face of the card. What makes the game interesting is that you - or your opponents - can lie about what cards you place. On your turn, click the card(s) (up to four) you want to play, select the value you wish to say it is, and click "Go!" You do not have to choose all the same card, or tell the truth about the value of your cards. Sometimes you get away with it and sometimes you don't. If you are lying and you are accused by one of your opponents, you will have to pick up The Pile and add it to your hand. If, however, you are telling the truth and you are accused of cheating, the person who accused you will have to add The Pile to their hand. The choices of values you are given will consist of the card played by the last person (unless someone accused them of cheating, in which case you'll be able to play any cards), and the card value one above and below it. 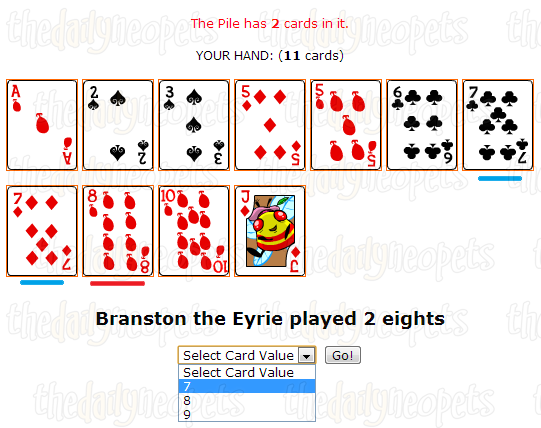 For example, in the below screenshot, the last card played was an 8 and no one accused the last player. That means you could say you are playing 7s, 8s or 9s. On your opponents' turns, they will say how many of what card value they played. You will have the choice to accuse them of cheating or let them slide. 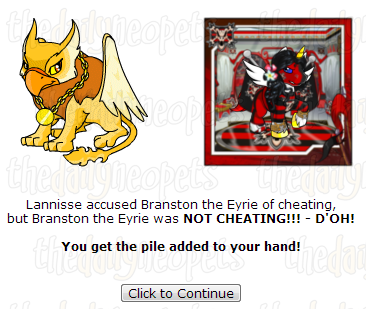 Like on your turn, if you accuse them of cheating when they are, then they will have to pick up The Pile - and you will win some Neopoints. However if you accuse them of cheating and they are telling the truth, you will have to pick up The Pile. If you win the round by successfully playing all of your cards first, you will be presented with a sum of Neopoints, a Battlecard and the option to advance to the next round. As you advance in rounds, you will rotate through opponents and the number of Neopoints you get for catching a cheater increases. If you choose to return to the game room rather than continue, your game will not be reset, and you can pick up where you left off when you return. Depending on how many rounds you've completed, you may also be awarded with a trophy. You earn a bronze trophy after the 3rd round, a silver trophy after the 5th round, and a gold trophy after the 7th round. Play it safe. For the most part, it's best not to cheat. It's a lot safer. If you do have to cheat, try to only play one card. Also, choose an option close to the value you're saying it is or one that has been played so much everyone cheated and can't be sure whether you're telling the truth or cheating. Count cards. Try to remember how many cards of each value you and the other opponents have played since the last time The Pile was picked up. When you're trying to decide whether to accuse someone else of cheating, you can use that information. 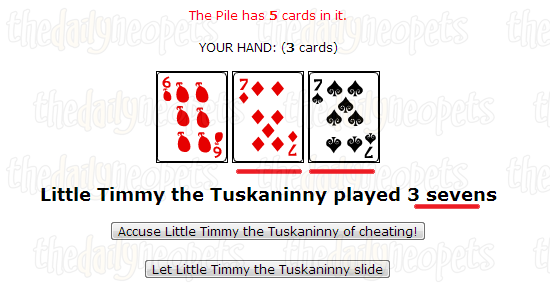 Like a real-life deck of cards, there are only 4 cards of each value in play, so if you already played 2 Aces and Little Timmy says he has 3, you know he's cheating. Remember to include the cards still in your hand in your count! When you have nothing to lose, go for broke. When someone else is playing their last card(s), always accuse them of cheating. If you're wrong, you're going to lose anyways. If you're right, you just bought yourself more time. The opponents will do the same to you, so try to not cheat when playing your last card if you can help it. Note that the numbers shown under their names are the cards that will be in play after their turn ends. If it says 1, they still have a card. Cheat! is a fun, easy game, relying on luck and strategy. It can get a little monotonous at times, especially with all of the page loads, but it can be very relaxing as well. It's not the best game for Neopoints, but it's excellent for adding some extra glitter to your trophy cabinet!